Want Some FABULOUS 4th of July Pics? Follow These Tips for Taking Your Best Photos! 1) Turn on Image Stabilization and Use a Tripod! – When it comes to shooting fireworks, or any low-light scene, don’t go it alone. No matter how advanced your camera may be there is no better image stabilization than a tripod. If you don’t have access to a tripod, try using any surface to steady your camera, whether it be a tree, fencepost, chair, etc. Because you’ll be using longer shutter speeds, you must keep your camera perfectly still in order to capture crisp, clear images free of any blur caused by camera shake. 2) Setting Your Camera’s Shutter Speed –if you have a digital camera which offers a manual shooting mode, you have the ability to adjust your shutter speed. 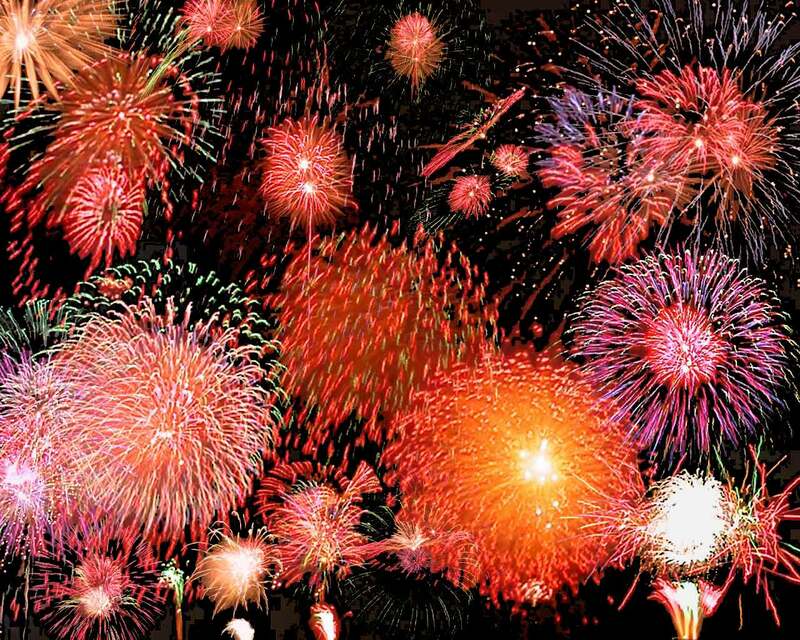 Shutter speed plays a crucial role in photographing fireworks. Depending on the look that you want, your shutter speeds can vary anywhere from one to 10 seconds. Longer shutter speeds will allow you to shoot one or multiple explosions from start to finish, capturing the full bursts and light trails; however, just because it’s dark, don’t use too long a shutter speed as you’ll risk over-exposing the image. 3) Setting Your Camera’s Aperture – Again, if your digital camera offers a manual shooting mode, you can manually configure your camera’s aperture setting. When it comes to setting your camera’s aperture it’s important to remember that while the nighttime sky is dark, the light that fireworks give off is fairly bright. The aperture that you can set will depend on your digital camera, but estimate using an aperture anywhere between F8 - F16. Practice makes perfect as there is no clearly defined rule when it comes to setting shutter speed and aperture. Experiment early on with the first few bursts to make sure you have the appropriate settings and to adjust where needed. 4) Setting the ISO – You should also manually adjust your camera’s ISO setting. Your camera’s ISO refers to its sensitivity to light. Typically, in a lower light setting, you would want to boost your camera’s ISO, but due to the bright light given off by the fireworks, you’ll want to stick to a lower value. Try setting your camera to the lowest ISO possible. An ISO of 100 or 200 should yield good results and provide a clean image. If you’re using a point-and-shoot camera without a manual mode, you can still take great photos of fireworks. Dial up your digital camera’s scene mode menu and search for a scene mode called “fireworks.” Most of Samsung’s point-and-shoot digital cameras feature the “fireworks” scene mode. Selecting the “fireworks” scene mode will automatically adjust your camera’s settings to capture the best image possible. But remember; still try to use a tripod or other surface to steady your camera. And last but not least, the most important tip to keep in mind is to have fun. This is your chance to express yourself and be creative, so play around with framing the shot both vertically and horizontally. A digital camera gives you the ability to take a preview shot to see if you’ve dialed up the appropriate settings and better yet, allows you to delete those that didn’t turn out so well. A larger memory card will also allow you to fire as many shots as you can, improving your chances of capturing some really spectacular photos. 2 Responses to Want Some FABULOUS 4th of July Pics? Follow These Tips for Taking Your Best Photos! I am following back! Thank you so much for following my blogs. I love the look of your blog and I can’t wait to see more! This is great advise. I have never been able to get very good pix of fireworks. I am definitely going to try this, I will let you know how it works out. If you took that top pic it obviously works. Wanted to stop by to say hello and wish you a safe and happy holiday weekend. Make sure you come by and check out the new posts, contests, polls, and giveaways!